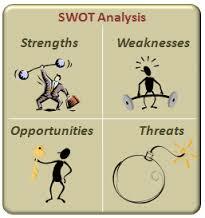 SWOT analysis is potential strategies derived from the synthesis of organizational strengths, weaknesses, opportunities and threats (SWOT). The partnering of the different elements and the extensive data collected as a result of the analysis can serve as a spark for roundtable discussions and refinement of current strategies or generation of new strategies. The SWOT analysis enables companies to identify the positive and negative influencing factors inside and outside of a company or organization. Besides businesses, other organizations, in areas such as community health and development and education have found much use in its guiding principle. A SWOT analysis focuses entirely on the four elements included in the acronym, allowing companies to identify the forces influencing a strategy, action, or initiative. Knowing these positive and negative impacting elements can help companies more effectively communicate what elements of a plan need to be recognized. 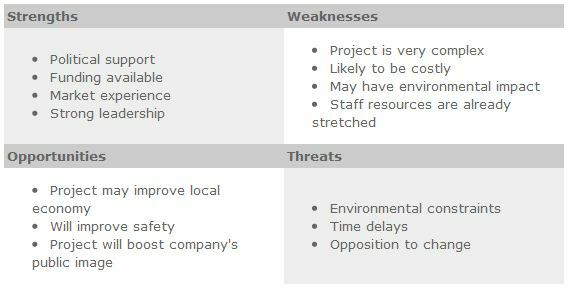 When drafting a SWOT analysis, individuals typically create a table split up into four columns so as to list each impacting element side-by-side for comparison. Strengths and weaknesses won’t typically match listed opportunities and threats, though some correlation should exist since they’re tied together in some way.